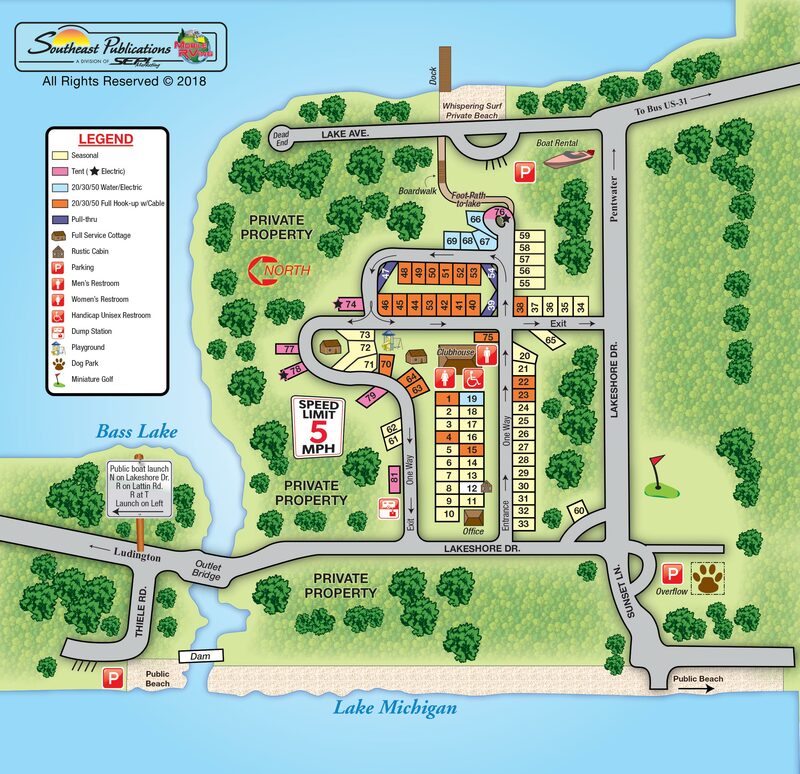 Michigan’s Oldest Privately Owned Campground – operating since 1913. Whispering Surf embraces the idea of old fashion camping – forested with oak, pine and white birch and nestled between the clear blue waters of Bass Lake and the white sands of Lake Michigan. Tucked away in the North Woods, it’s a slow moving pace where you can relax and enjoy the best of what camping has to offer. Whispering Surf changed ownership in 2017, just the third owner in over 100 years. Proprietors, Jane & Andy Hathaway haven’t stopped making improvements to this beautiful camp while making sure to preserve the flavor of what makes Whispering Surf so special. The historic Lodge offers recreation for the entire family and is available for group events. Our private beach on Bass Lake is a short walk through the park and the beautiful beaches of Lake Michigan just as easy a walk down Lakeshore or Sunset, you choose. Our dock on Bass Lake is available to tie off your watercraft on a first come first serve basis ( restrictions do apply, please ask at time of reservation ). Canoe and kayak rentals are available. Enjoy our complimentary mini-golf course for some competitive family fun! Free WiFi is available throughout the park. Saturday and Sunday mornings enjoy complimentary coffee and freshly popped popcorn on Saturday evenings in our Lodge. Our cozy, quiet sites feature FHU with 20/30/50 AMP service and cable TV- one of the only campgrounds in the area to offer cable. We also have a few W/E sites as well as rustic tent sites. Every site comes with a picnic table and fire ring. Firewood and ice are available for purchase at the camp office. Two historic cottages have been renovated for guests who don’t own an RV. The Dorothy Cottage features 3 BR’s and the Davis Cottage features 2 BR’s – both with fully stocked kitchenettes, full bathrooms and beautifully furnished. Both cottages have outdoor seating areas and gas grills to add to the camping experience. New for 2019 is our rustic camping cabin – our old office has come full circle and is now back to being a camping cabin. One of the original to the camp, this cozy little cabin has one set of twin bunk beds, breakfast bar and cable TV. A gas grill, picnic table and fire ring on the outside. Perfect for a couple. Whispering Surf offers a children’s playground and group fire pit for evening socializing. Your well behaved pet is welcome at Whispering Surf and will enjoy the new Bark Park. Our campground and bathhouse are guaranteed clean and friendly! Reservations are suggested for all weekend, holidays and for groups. Call to reserve your site 231.869.5050.